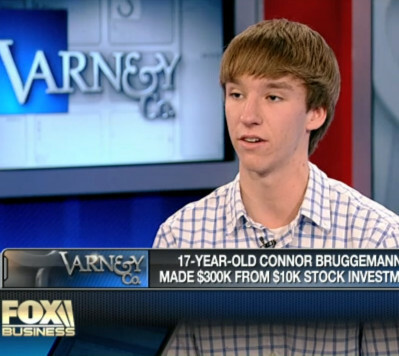 Connor Bruggemann was an ordinary 16 years old teenager from New Jersey. Well, maybe not too ordinary, because this kid had managed to save around $10 000 for the last two years, working as a waiter and on some other low qualification jobs. Then he asked his dad to open for him a trading account at an online broker called Etrade. The young Bruggemann invested his money in some blue chips, but this didn’t bring some good return on his investments. This is how he decided to sell all his shares of big and established companies and invest the money in the so-called penny stocks. These are the stocks of companies that are traded at really small prices, the price of one share is usually several cents (pennies), and this is where their name comes from. Such companies usually have some serious problems, this is why their share price is so low. But investing $10 000 dollars in such high-risk businesses turned out to be a really lucrative investment strategy for Connor. His money quickly became growing and he started making thousands of dollars. Many of his trades he executed while attending school, under the desk, from his iPhone. He is at a high school after all. The young Bruggemann has had an interest in earning money from a very young age. He started working at 14 and has been saving since then. He tried putting his money in a bank account, but he was not happy at all from the returns there. He even tried betting money online, but his parents were not really happy about this when they learned about these activities of his son. One day his grandfather advised him to try the stock market. This is how the young stock trader began his career. One of his best trades was made with shares of a corporation called American Community Development Group Inc, Connor took advantage from a rumor, that the CEO of the company had plans to buy back shares. Bruggemann bought around 3 million of them at $0.003 per share and after a few days, the shares buyback program was officially announced. The price quickly began going up and in no time the young investor had made a big profit. He closed his position at a price of 4cent, cashing in more than a hundred thousand dollars in profits. This was just a fluke maybe, but since then, Connor has made many other successful trades. He managed to increase the amount in his account to $300 000. Here is how the power of technology today reveals new opportunities. Trading stocks on your phone were impossible just a few years ago, but today everybody can do it and some people do it well. Please, note that trading is really risky! Don’t try this at home, if you don’t really know what you are doing. There is a big risk for you of frittering away your money. You could share this article if you enjoyed reading it. Thanks!